Start your week off right with this easy Meal Plan. I’ve got you covered with Meatless Monday, healthy options, and even slow cooker meals. What’s not to love? It’s a New Year and a new series on the blog! One of my personal resolutions this year is to be better at planning my dinner menu. I find that when I have my week of meals planned, it makes grocery shopping easier. AND, it makes getting dinner on the table much easier too. I know exactly what is on the menu each morning. So, each weekend I’ll be sharing a menu plan for you. Print the recipes and hit the grocery store. It’s going to be that easy! I’ll even throw in a delicious dessert for the week! If you have suggestions, I’d love to hear them. Feel free to leave me a comment or shoot me an email! Butternut Squash Black Bean Enchiladas: meatless Monday recipe idea! Slow Cooker Italian Chicken Sandwiches: easy dinner idea! You can double the chicken in this recipe and set some aside so that you have extra cooked chicken for the soup recipe this week! Turkey Taco Potato Boats: keep it healthy this week with ground turkey. Chicken Pot Pie Soup: use that leftover chicken from earlier this week to make dinner in under 30 minutes tonight! Italian Beef Ring: this is a great weekend dinner idea to serve up during a football game or just a quick and easy meal! No Bake Cheesecakes: your week is now complete with these No Bake Cheesecakes. And “pay it forward” this week by giving the second cheesecake to a friend or family member! Have a great week! I look forward to hearing from you if you give this dinner menu a try! 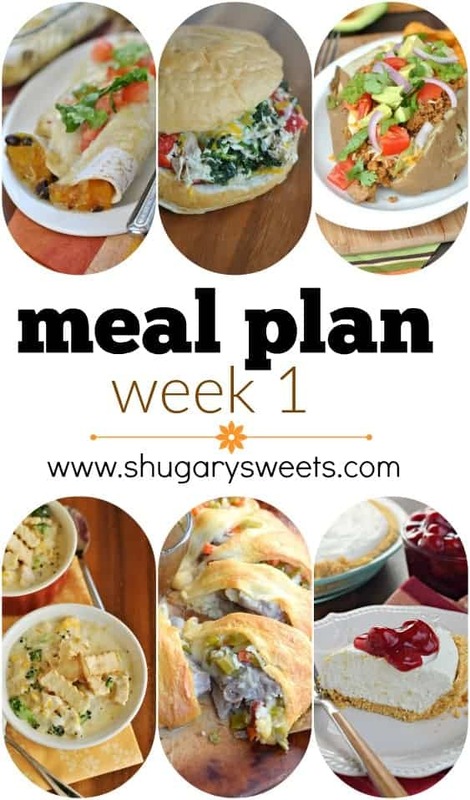 Follow Shugary Sweets’s board Weekly Meal Plan on Pinterest. So many great recipes to try Amy! Great for those more rushed mid week dinners. Although I have my eye on those no bake cheesecakes! Love the menu plan. So many great recipes. Thanks.